Best-selling author Brad Meltzer almost couldn’t believe his eyes when he saw it in a footnote – had there actually been a secret plot to assassinate one of our Founding Fathers and the first President of the United States, George Washington? Turns out there really was a secret plot to try and kill Washington in 1776 – and Washington discovered it, Meltzer said. 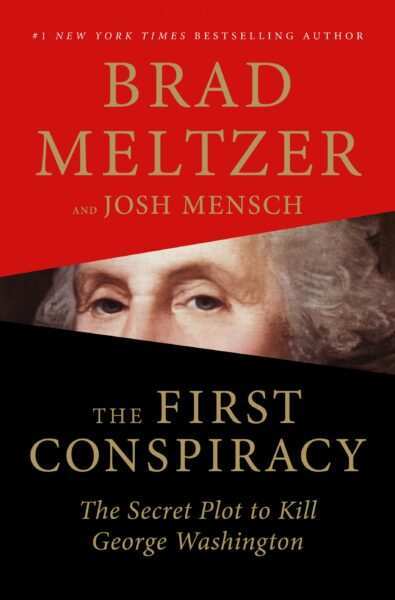 Brad Meltzer’s latest book, “The First Conspiracy,” has been released. “He gathered those responsible, built a gallows and hanged one of the conspirators in front of 20,000 people – the largest public execution in North America at that time. I became obsessed with the story,” Meltzer said. When he initially uncovered the little-known conspiracy, Meltzer contacted Pulitzer Prize-winning author and historian Joseph Ellis, who has written about Washington. “He said it was real, but he warned me that it’s a story about Washington’s spies,” Meltzer explained, which led to even more intrigue. He did find much of it, and it wasn’t necessarily that hard to find. All the research was done online. “We have in our phones access to more information than in the entire library of Alexandria. But oddly, the hardest thing to find today is the truth. That’s what’s so incredible to me,” Meltzer pointed out. The information was all there, but no one had uncovered it yet. Once they discovered transcripts from a secret tribunal that took place for one of the men who was eventually hanged for the crime, “That’s when the whole thing cracked open,” Meltzer said. When Washington discovered the plot, which involved some of the people who had been closest to him, he created a secret committee called the Committee on Conspiracies. This was led by John Jay, a fellow Founding Father who would later become the first Supreme Court Justice. In fact, today at CIA headquarters is a room dedicated to Jay, who is considered the father of counterintelligence. While the book is a thrilling read about history, it’s actually a book about leadership, Meltzer stressed. “You think we’re deeply divided now? Imagine then, when there were as many British Loyalists as there were Patriots. And the military was no different,” Meltzer explained. There are several scenes in the book that show Washington’s true character, and his sheer level of humility might surprise many readers, he added. Additionally, it’s a snapshot into Washington as a human being, even though he is easily one of the most recognized and revered figures in all of history, very often put on an untouchable, unrelatable pedestal. In a key moment that Meltzer says truly shows Washington’s character, the general and his men are pinned down by the British in New York. “I love that you get to the secret plot against him, but that you also get to see his character,” Meltzer added.